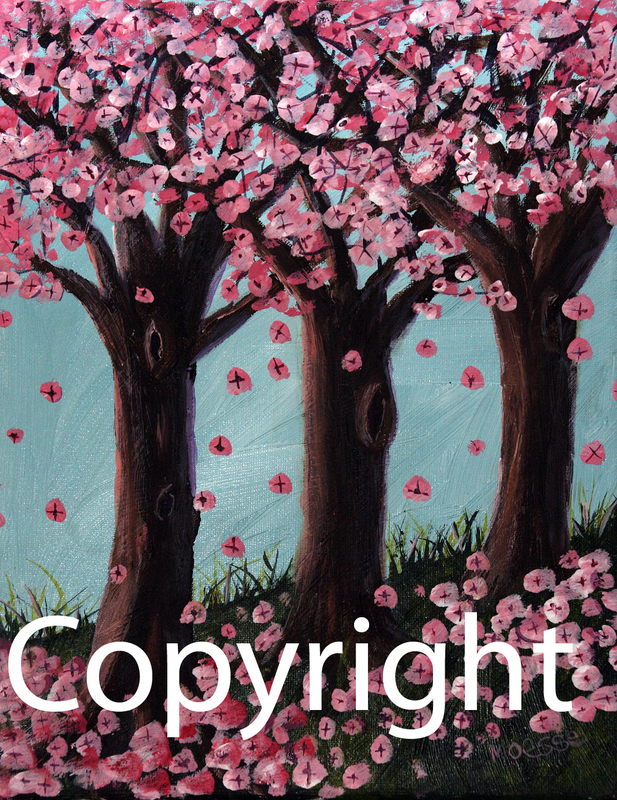 Painting of Cherry Blossoms falling in the aftermath of the tragic earthquake and tidal wave in Sendai Japan in 2011.
me. He was posted in Japan twice over the past several decades as a career diplomat and knows the culture very well. He said the Japanese as a nation celebrate the Cherry blossoms when they arrive not only for the breathtaking beauty of the display, but because of what they symbolize: the transience of life. As an artist, I sometimes HAVE NO CHOICE but to process emotional events and occasions. Often I write. Today, I had to paint. I bring you “Psalms for Sendai.” And yes, this is not just a sweet little picture. It’s loaded with hit-you-over-the-head intentional symbolism which is not subtle at all, sorry about that! As for the term “grief bubbles” in the title, I borrowed that from a new twitter friend / lovely artist who occasionally tweets about grief bubbles floating up into the great beyond in remembrance while releasing the pain. I thought it was such a lovely way to express it, I had to borrow it for this post’s title. In closing, even though I’ve processed some of the sadness that’s enveloped me since Friday, I still feel a well of tears inside for the lost and suffering there on the other side of the planet. My heart aches for those people and for that lovely country I’ve yet to visit. Still, I draw some consolation, remembering the cherry blossoms that are just about to bloom. This entry was posted in Uncategorized and tagged Cherry Blossom, Earthquake, Japan, Sendai, Tidal Wave. Bookmark the permalink.